Despite the association between liberal arts institutions and the humanities, William Jewell College has a successful STEM program through which students have been able to present their independent research at national and international conferences. 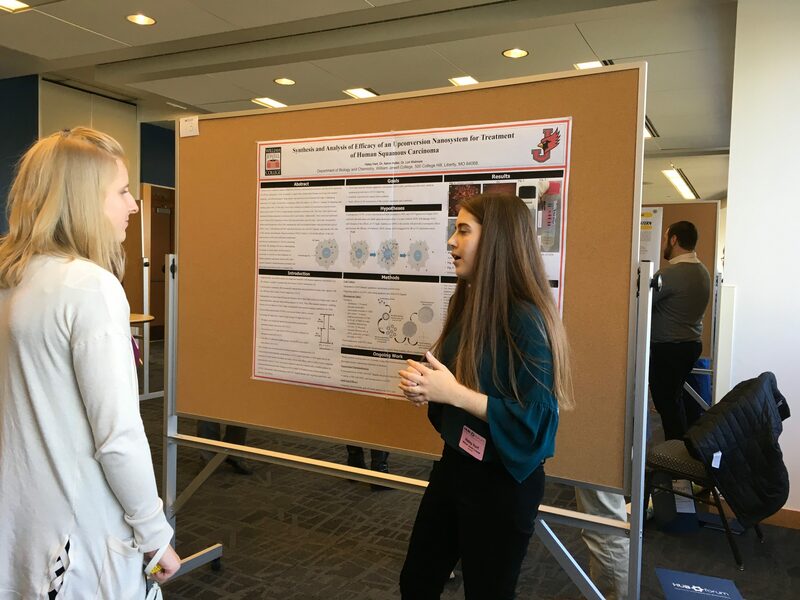 Sam Fulte, senior biochemistry major who is engaged in research about the human gut microbiome, described that attending conferences enables students to develop networks and learn about opportunities beyond Jewell. “One of the cool things about conferences for undergraduates is that they normally have a networking session or a graduate school information session. Conferences are a good place to explore different graduate schools or career opportunities after college,” said Fulte. Fulte recently attended the annual “Out in STEM (oSTEM)” conference in Houston, TX, along with Alexis Mann, senior Oxbridge: Molecular Biology major, and Sofia Arthurs-Schoppe, junior chemistry and communication major. 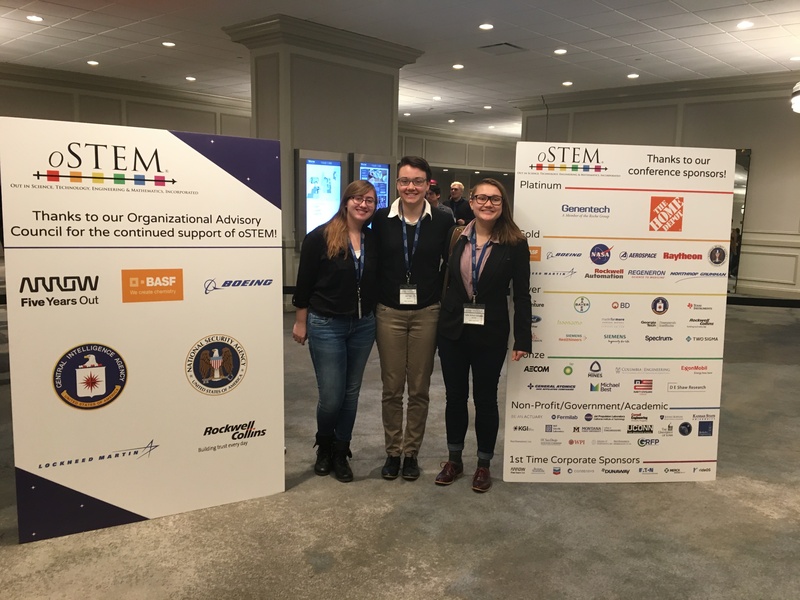 (From left to right) Alexis Mann, Sam Fulte and Sofia Arthurs-Schoppe at the oSTEM conference in Houston, Nov. 2018. Mann, who focuses on trying to better determine the mechanism behind axonal degeneration associated with Alzheimer’s disease as well as potential pathways that could rescue (or slow the degenerative process) said degeneration, noted that attendance at this conference was made possible only through support and funding from faculty and staff at Jewell. At the oSTEM conference Arthurs-Schoppe, Fulte and Mann each presented their research to students and professionals in the STEM field. Approximately 1,000 students were in attendance of the conference and representatives from companies including Boeing, the Central Intelligence Agency (CIA) and the National Security Agency (NSA) were present. Emily Dema, senior Oxbridge: Molecular Biology major, has spent the past few years studying the genetics of innate immunity in model organisms. This research has potential application in the field of medicine and is particularly relevant in response to the global rise in antimicrobial resistance. 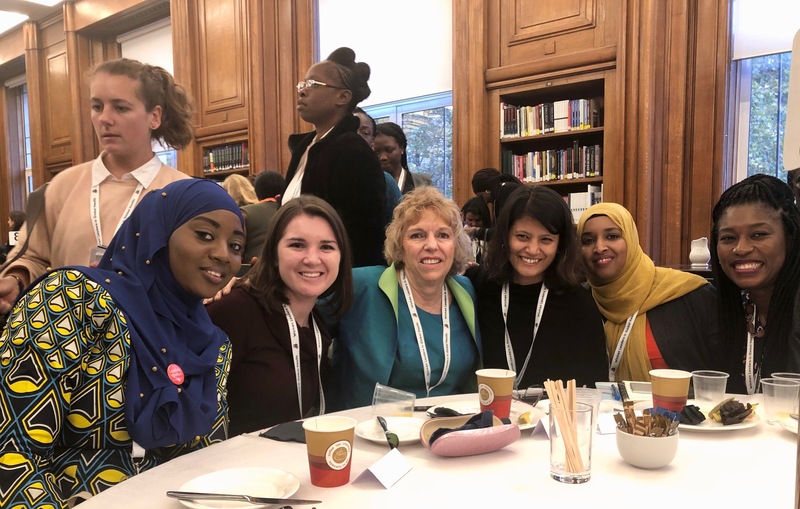 Dema was recently able to take this knowledge abroad to participate in a mentorship program at the Women Leaders in Global Health (WLGH) Conference hosted at the London School of Hygiene and Tropical Medicine. Emily Dema (second from left) at the WLGH conference in London, Nov. 2018. Participation in this conference enabled Dema to develop a strong network and attain insight into her field of choice. Many Oxbridge students utilize the opportunity to present to international audiences while abroad in their junior year. Haley Hart, senior Oxbridge: Molecular Biology major, has been researching cancer treatment options by working to design and create a nanoparticle drug delivery system combining positive aspects of different types of treatments to eliminate the negative side effects of current treatment options. Hart’s research has widespread potential for application across the globe and she was able to develop her knowledge base by attending diverse conferences while abroad. “Most of the conferences I have attended were in Oxford. I took advantage of some memberships there and attended as many relevant conferences as I could. A few examples are Oxford University Psychology and Neuroscience seminars and workshops, Society of Spanish Researchers in the UK Neuroscience Symposium, Oxford Nuffield Clinical Neurosciences Symposium,” said Hart. Fulte, Hart and Mann all presented their research at the Heartland Undergraduate Biochemistry (HUB) Forum hosted at the Kansas University Medical Center this November. There Mann was given an award for the best presentation of an undergraduate poster. Haley Hart presenting at the HUB conference, Nov. 2018. Mann attributes her win to practice and advises students to invest time into honing their presentation skills. “In my opinion, doing these poster presentations [at] conferences is just something people need to practice to prepare. Understanding your research and being comfortable talking about it is the first step, but when you talk to different audiences about your work you need to learn and adapt to the audience so that everyone that talks to you at least has some level of understanding of your work,” said Mann. This was Mann’s second time presenting at the HUB Forum – both Dema and Mann presented at the Nov. 2016 Forum where Jewell students were awarded first, second and third place in the poster presentation category, Mann was a member of the team who placed second. Fulte, Dema, Hart and Mann are all planning to present their research at the Tribeta District Conference in April 2019. Tribeta is the national biology honors society and students must fulfil strict academic standards in order to be initiated and awarded the opportunity to present at conferences. Fulte will also be attending the Keystone Symposium over the Microbiome in Montreal, Canada, in March 2019. Her application to present at this conference is in the review process. After receiving sponsorship from an alumnus, the chemistry department at Jewell is able to send some students to present at the national American Chemical Society meeting in Orlando, Fl, in Spring 2019. Approximately 14,000 people are expected to attend this conference and Arthurs-Schoppe, Travis Colpitts, Zach Hand and Nick Hartwig will be there to represent Jewell. STEM is the term used to describe the science, technology, engineering and mathematics fields. At Jewell some of the most popular majors in these fields are chemistry, biology, biochemistry and physics. Biochemistry, biology and chemistry majors at Jewell are required to conduct two years of research under the mentorship of a professor. Physics majors are required to complete one year of research.